I saw this photo on my friend’s Facebook page a few weeks ago. I saved it and, today found it again. 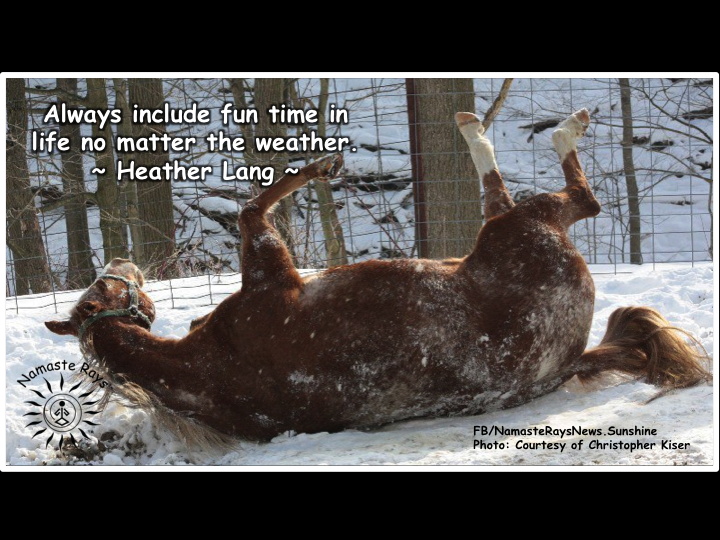 When I first saw it, it made me smile as I thought “this horse is really enjoying the snow!” The horse was having fun. Life doesn’t have to be so serious. To make the most out of life, make more room for fun! Always include fun time in life no matter the weather. The weather of life is chaos. There will always be chaos in life. It’s is part of the balance in life. It’s a learning lesson. To continue to be serious in all situations only harms you. You become unbalanced. And being imbalanced creates stress, dis-ease & illness. Balancing our lives with more fun and laughter is truly a tonic to wellness. Making time for fun, doesn’t necessarily mean we must create fun time. It means finding the fun in all situations. Grumbling about our situations, the weather, road conditions, work or others in our lives is a way to expend our energy. Why not expend our energies looking at the fun side of things and acting on them? Snow days! Remember how fun it was when it snowed when we were children? Or being at the beach, and it rains as children? What do children do? They play in the snow and dance in the rain! Why? Because it’s fun! They are taking the situation and making it fun. As adults, we need to rediscover this creative aspect to our lives. Is the rain really causing chaos to our “perfect” beach day? No, this is your judgment of what you want to happen, versus going with the flow. You are at the beach…there is water at the shore. A little more water falling from the sky shouldn’t ruin the day. Dance in it. Swim in the ocean. Bundle up and go sledding, skiing, make a snowman or snow angel. Remember how fun this was? When we can see the fun in all situations, we enjoy all situations and are happier. Happier is a state we all wish to be in. So, why not make the choice to do so? Balance out the chaos & seriousness with fun. Find the happy medium between too much serious situations and fun ones. In this way, you will lead a happier life. You will live in a state of happiness. May you make time for fun each and every day. Excellent! So welk written and of course I lovevthe horse photo. Thanks Heather. Thanks, Celia! Horses are such wondrous creatures! I’m so happy you have been enjoying them! I’m hoping to have yoga plans soon at a studio in Avon and will definitely include you on the information! Otherwise, we’ll see what’s up with the “Bay” yoga or other places! !